The northerly view from the deck at Washington Way Chalet is of San Juan Channel and the islands of Shaw, Orcas and Jones. The rocky shoreline below the deck. We so enjoyed our stay in this home. It is convenient to town but so peaceful. Thank you. The Chalet was comfortable and had a stunning view. Unfortunately our stay was impacted by the smoke from distant BC fires. Unlike some vacation rentals we've visited, the kitchen was well equipped and most everything worked. The location is close enough to Friday Harbor that it provided easy access to activities and supplies and far enough to be out of the bustle of the tourist crowd. The water supply is a shortcoming. The pressure is low and if someone is showering on the lower levels the upstairs shower is without water. Lighting was a minor issue. In one bedroom there was only one lamp with a 20w bulb and the ceiling light in the great room did not work so reading was limited to dining and kitchen areas. If a person is challenged by stairs this location could be a problem as there are stairs leading from the garage/parking and stairs to access the three levels of the chalet. For us the plusses outweighed the stair climbing. I absolutely love this place and could have stayed there forever. Just sitting on the deck we saw a bald eagle fly by plus a family of five River otters below. Beautiful quiet setting. This home is lovely and very spacious. Great washer and dryer. Perfect location, close to town but far enough away so you so it's tranquil and quiet. Perfect place to relax. Easy drive to enjoy the town. House very well equipped. Only thing missing was house book with local and house info. Amazing location, view and facilities. No complaints or issues. Woulsnt hesitate to go back and also recommend to others. The number of stairs was the only negative. I was worried about the size for a group of 6, but Washington Way easily accommodated all of us - with 3 floors of living space, we never felt crowded. The pictures don't do the views justice; they are AMAZING! We saw both sunrises AND sunsets over the ocean, and felt like we were the only people around for miles! My only note of caution is that the couch in the basement does not pull out and thus only sleeps 1, which seems like a big miss in an otherwise fantastic rental. It would be the ideal living level for a couple, complete with its own bathroom and balcony, if it had a bed. Still, that's a minor complaint and it was well-suited for my niece who adopted it as "her apartment" during our stay. :) Everything was clean, lots of supplies to get us started, and I just can't say enough about those VIEWS! I would gladly return to Washington Way and recommend it to family and friends. A very nice location A well equipped house. A couple of minor (& I do mean minor) maintenance items need attention. No Big deal.Quite enjoyed our stay. We had a very nice experience staying at this home. It was very comfortable and the environment was very relaxing and peaceful. Love this place and this island! What a view to wake up to each morning. Enjoyed sitting out on the patio each morning with our morning coffee and looking over the straits and just soaking in the serenity and the beauty. Fabulous view with floor to ceiling window looking across to deer Harbor on orcas Island. Large deck to enjoy the view from. Great location about five minutes out of Friday Harbor. Lots of Nic nac nautical theme. Large kitchen where three people can easily work from. Showers all had extremely low pressure requiring a long time to complete shower. Central heating system was very loud. Staff was very responsive to maintenance issues. We loved our stay and would stay again for the view alone. The views here are wonderful, mesmerizing really. 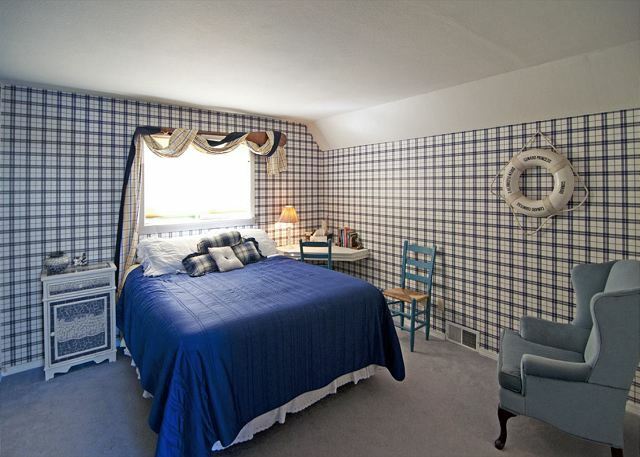 The house is very well equipped and the furnishings comfortable. The chairs in the living room will surprise you, they look like they would not be comfy but they are the best! The twin beds in one of the bedrooms are very squeaky, so if you are a light sleeper, you might have a hard time of you are in there. It is a great place for family, but walls are quite thin, so noise is heard by all. Kitchen was great, so much in there and all very cute and nautical themed. We made some great melas and the Weber BBQ was a real plus. Overall it was excellent. It would have been better to have known that the central heating system wasn't working and we would have to rely on a heating stove that needed to be fed 25lb bags of wood pellets. Lugging these pellets from the garage down a flight of steps would not work well for some vacationers. First, there needs to be something about this in the marketing of the home and 2nd there needs to be a way to have the fuel more readily available. This is not a small issue when it's cold throughout the day. The property managers handled the situation very well when it was brought to their attention, but a longer terms solution needs to be found found. The central furnace in the home had malfunctioned shortly before your arrival - so sorry about our sudden cold snap! It will be repaired during the winter so that future guests will not have the same "chilly" night that you did. Our apolgies. Three of us stayed at this home for 6 nights and we never saw or heard any neighbors (except for the one deer who showed up every day). We enjoyed it very much, the views from the living room and deck are awesome. I was a little disappointed that there where no lounge chairs or comfortable furniture on the deck, I would have liked to sit out there more, the chairs are a bit hard. The driveway needs some lights or reflectors, it's very steep. Other than that it was great. The island is so clean, never saw any litter, beautiful trip we all enjoyed it very much. We had an excellent experience with the property. The upstairs deck held a magical allure. We sat there for hours at dawn and dusk observing the sea, the sky with their ever changing colors, and the ferries that went by. The property was quiet, comfortable and private and had all the amenities we needed. Three Girls From Grier School, Tyrone, Pa.
A wonderful stay, Kitchen was really nicely equipped, could use an oyster knife so used a screwdriver., Plenty of room and we had a resident harbor seal in water morning and night.Had a heating malfunction & mgmt came immediately. Only thing that would have made it more perfect would have been some south and west exposure for heat from sun. Happy campers. (display name as Ava D, Camp Verde, Az. Beyond our expectations! Every aspect of the experience was exceptional, especially the house, itself. The company was professional, available and helpful with each step of the rental process. The house was clean and very well-stocked with all the basic necessities; the household furnishings and furniture were very nice and we were comfortable from the moment we walked in. The setting was spectacular - our deck time was thoroughly enjoyed every morning and evening. My only suggestion would be to provide an estimate (percentage would do) of the added costs, such as taxes (which were on the high side), cleaning fee, etc. earlier in the inquiry process. The only comments would be better lighting (lamps) in the bedroom and perhaps an updated sofa bed downstairs - or air bed even since most sofa beds aren't exactly the most comfortable. Otherwise it was a good house, good location and the cleaning person even helped us when we arrived. Very nice.....check your directions as it does say 2nd driveway and it's the 1st. We had a great time at Washington Way Chalet! The home is very comfortable and well appointed. The beds are great! And we even saw Orcas from the deck which was a special treat! The location is great! Close to town and with great views. Also saw lots of birds and deer. The driveway is steep getting in but the Property Management company had warned us so we were prepared. We stayed 4 nights in early July with 4 adults. The house was well-appointed and felt roomy. The lower and upper decks are very nice and the views are wonderful, so nice being right on the water. A sea otter occasionally dines on the rocks just below the deck. The upper loft gets a bit stuffy at night, would have been nice to have more windows that could be opened. The location is also a bit removed from Friday Harbor; we drove back and forth, though you could probably bike it fairly easily. This home is a only a few miles from the center of town, nearer than most vacation home rentals. (Residential rentals within the town limits are prohibitied by community regulations for stays of less than 30 days.) All island addresses are Friday Harbor, regardless of where they are located on the Island. Out door heater broken. Could have used it!! We had a fabulous time biking the San Juan Islands!!!! We loved the location of this vacation rental on San Juan Island near Friday Harbor. It was just 5 minutes away from the ferry and town. It was stocked with most of the basic condiments including salt, pepper etc....which was great not to have to purchase them. Grocery shopping was nearby and the house was perfect for the 6 of us. Plenty of room to spread out and have privacy if you want it. I would stay here again if I went to the area. We loved every minute of our San Juan Island vacation, and this home was a perfect place to relax and enjoy the beautiful views. The only problem we had was leaving it! Very quiet, quaint and comfortable. We would definitely rent this property again. The guest book reflects comments written by daughters 4 and 5 in 1998 with the hope that we would return. Mom, Dad, daughter 3 and husband returned in 2011 and enjoyed the stay as much as we had previously. Hopefully, we'll be back before another 13 years have passed! Stayed at this property 9/17 - 9/24, 2010. Views of the water and islands were great - when it wasn't raining. House was nicely appointed and provided most everthing we needed or expected in a vacation rental. A couple of very minor comments - never figured out how to get more than lukewarm water in the shower by the kitchen (though kitchen had very hot water), found the shower hard to turn off completely (to conserve water), and would have liked the option to unblock parental controls on Directv. All-in-all a good experience and we would recommend it to others. We couldn't have been more pleased with the accommodations, location for beautiful scenery, and overall more than satisfied with the entire experience. We had not been to the San Juan Island before and when we return (which we plan that it will be soon) we will again rent this particular property. Property management arranging for the rental was very helpful and gave us information regarding ferry schedules, etc., that we wouldn't have known otherwise. We were so pleased with everything and wished our time could have been extended. We really enjoyed this property and plan to visit again sometime in the future. One suggestion that I have is to add a couple of additional games to the game closet. Apples to Apples is a great vacation game for 3 or more people. Other games, even checkers or chess, are inexpensive and provide an alternative to watching TV after the sun goes down. Actually, we spent a lot of time sitting on the deck looking out over the water and that provided enormous entertainment for us, but our teenage daughter would have liked the games to play instead of just sitting on the deck. Teenages require a little more activity to make them happy, where adults are content just to sit for a change and relax. Otherwise, this was a great vacation place. We found that we did not want to leave...a sure sign that we're likely to return. Home-great - except for: toilet on main floor wouldn't stop running. We had to use either of the other toilets; BBQ needs work/replaced; and, our last night there we wanted to have a pizza and couldn't open the oven. Tip, don't order from Paradise Lanes - worst pizza EVER!! Otherwise, everything was great. Nice to have washer/dryer, extra bathrooms and outside decks! We had a great time. Thank you for everything! We loved this cabin's view!! The house was spotless and just 5 minutes from Friday Harbor. We appreciated the Satellite Dish TV so we could watch the UW Husky Football game. There are steep steps going down to the cabin which would be important to know if anyone has mobility issues. Not a problem for us and we had a great time here! Needed more dishwasher & laundry detergent for length of rental. Should provide guests with a vacum so they can clean up as they stay. Trash compactor & dishwasher not empty when arrived. All pretty minor, but a bit distracting. Otherwise ... fantastic.